^ 1.0 1.1 1.2 1.3 1.4 1.5 1.6 Davie, Lucille. Hillbrow Tower – symbol of Joburg. 2004-01-06 [2017-12-23]. 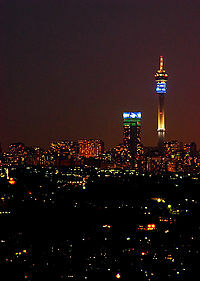 ^ 2.0 2.1 2.2 2.3 Telkom lights up Jozi's night skyline. Telkom. 2005-05-31 [2008-11-23]. ^ 3.0 3.1 3.2 Hillbrow Tower renamed. City of Johannesburg. [2008-11-23]. ^ 4.0 4.1 4.2 James Barber, Angela Fung, Sandeep Toshniwal, Becky Voorheis, and Campbell R. Harvey, Telkom, South Africa", Winter (1999). Retrieved 2011/03/17. ^ Hillbrow Tower. Emporis. [2014-12-31].